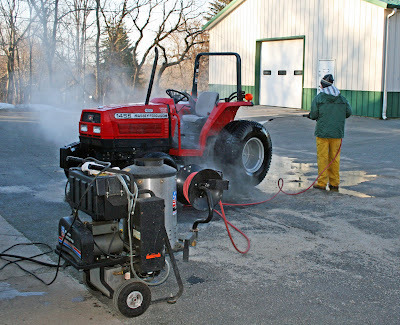 Ryan Sabino steam cleans the Massey 50 horsepower tractor. 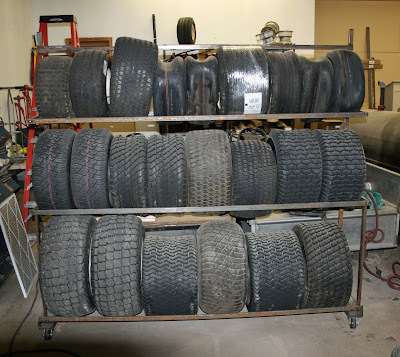 Chris Berry fabricated this new rolling tire rack for under $100. 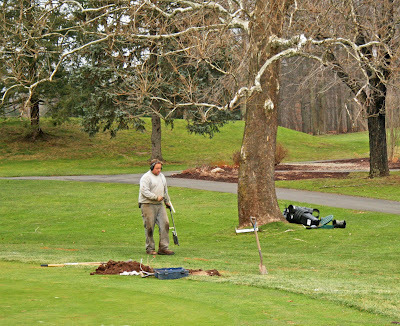 What does the grounds maintenance staff do all winter? You name it... We do it! 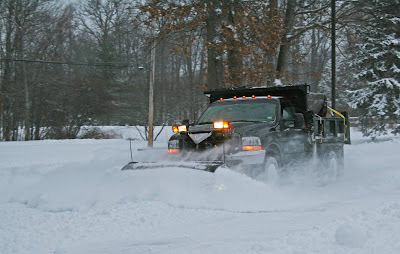 Ed plows the 10 plus inches from the parking lots. 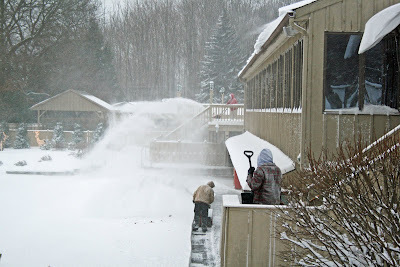 Chris and Dan running the snowblowers. 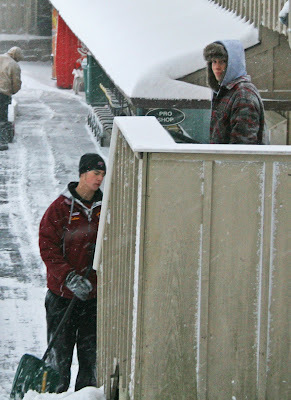 Ryan Sabino and Nick Capozzi take a break from Sheehan hockey to shovel snow at The Farms CC. They are the newest part time additions to our staff. Main lines completed including sod replacement. 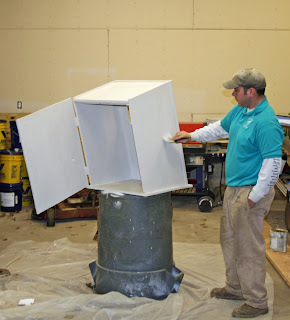 Large basin design is oversized to handle future drainage expansion. Stump Grinding and Outside Drainage Will Be Completed Today! Stump grinding between #9 green and the practice green will be completed today. This small trench is to help surface water exit the green during the winter months. 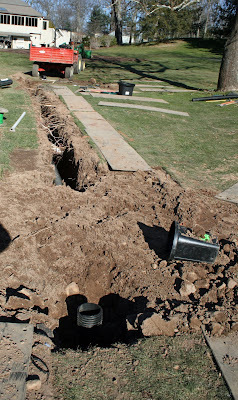 Basin & pipe installation will be completed outside the green cavity today. Drainage Work Continues With Basin Installation! 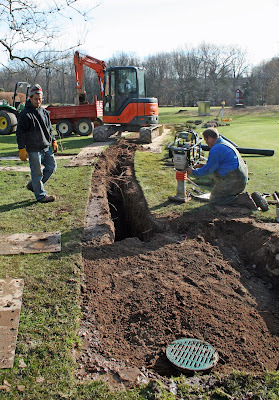 The drainage work continues today with the installation of basins outside the green cavity. Frozen ground did not slow down the process. I expect all outside basins and connections for the green to be completed by weeks end. 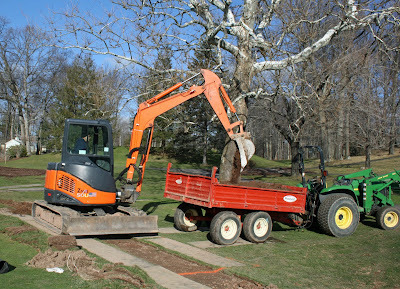 One of the additional benefits of this installation is the cutting of the tree roots by the excavator. This will further enhance the health of the practice green turfgrass. 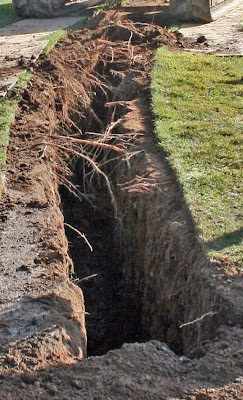 Tree roots constantly compete with turf roots for moisture and nutrients. Basin installation and piping designed to catch surface water before it reaches green. The workers take good care to make sure they do as little damage to the wet area as possible. The excavator rides on movable plates and all fill is dumped into trailer. Note the extensive roots which were cut. They were growing well into the putting surface. The Fence Is Complete And Drainage Has Started! The Fence around the lower parking lot was completed this morning. 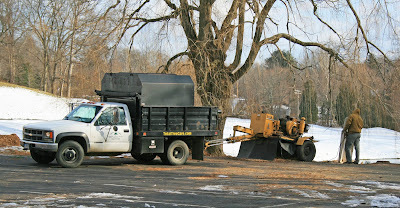 The drainage crew showed up at noon and began staging thier equipment. The most important task at hand was to complete all wire and pipe tracking to avoid any unnecessary accidents. The other important task is to cut all the sod in the rough so they can dig in the frozen ground over the next few days. 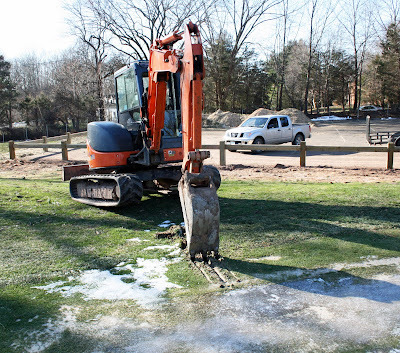 It is unlikely that any drainage will be peformed on the green until spring. 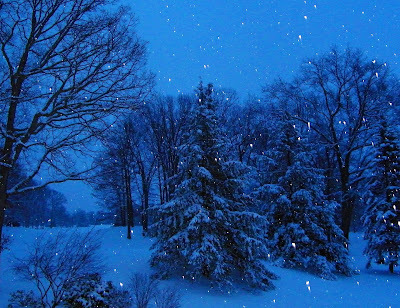 Temperatures are expected to be in the 30's during the day and fall into the teens at night. Our plan is to complete all drainage outside the green cavity this week. Project manager Willy tracks the wires and pipe. The crew unloads the equipment. 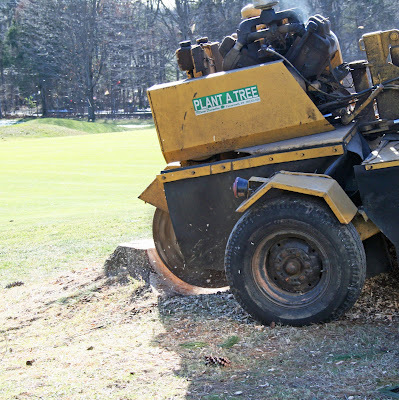 The grinder chews away at the pine stumps. 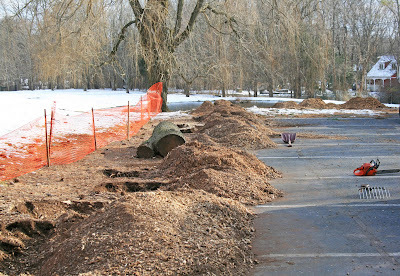 Stump grinding along the parking lot is complete. 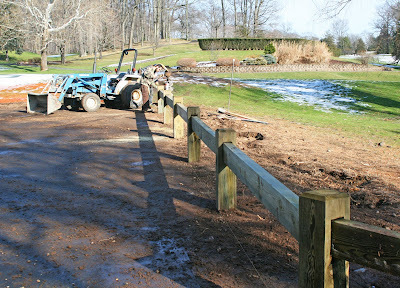 Fence installation will be completed by tomorrow. 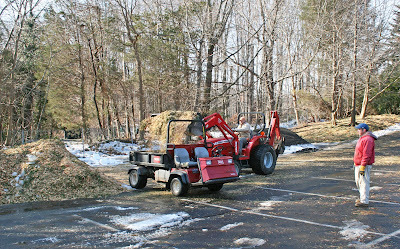 Maintenance staff re-locating wood chips. Wildlife Photos Posted In Record Journal! My wildlife photos were featured on the front page of today's nature section in the Record Journal. I'm excited about our free publicity and proud they liked them. The same photos and more are running in a slideshow on the side bar. If you click on "view all" you can see the enlarged pics. Have a great day! The Pine Trees Are Down! Stump grinding begins today! The fence should be installed next week. We are hoping that mother nature decides to cooperate so drainage work can commence. The pictures below certainly show a different look. It will be a dramatic change to the area next year. Turfgrass growing well on and around the green. Landscape enhancements will tie everything together. Stay tuned for more updates and photos. Practice Green Renovations Have Begun! The practice green renovations have begun! The scope of the project only includes the most rudimentary of components involving the basic needs for proper turf growth. We have been able to secure qualified contractors at a fraction of the cost compared to previous years of bidding. While the economy has had detrimental effects on many of us, there are economic benefits to having the foresight to do some projects with absolute merit. 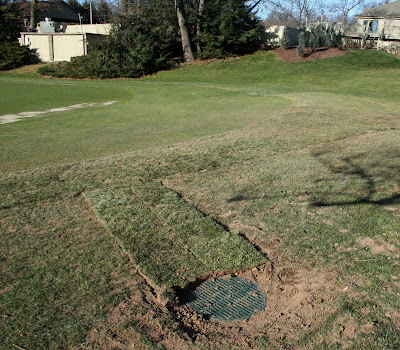 The practice green project focuses on providing sunlight and drainage to an area that is enjoyed by all members. Years of excessive growth to the surrounding pine trees has limited sunlight. The first key component needed to grow quality putting green turfgrass. Drainage is the second key component. 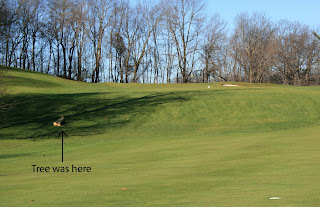 The practice green sits in a bowl where all surrounding water drains to (see photo #1). 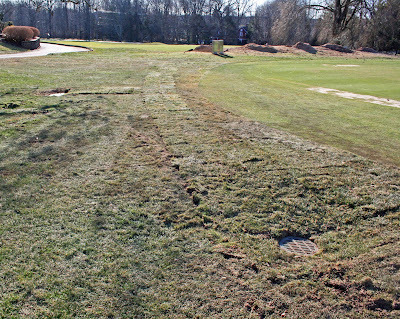 Wherever water collects, turfgrass dies. 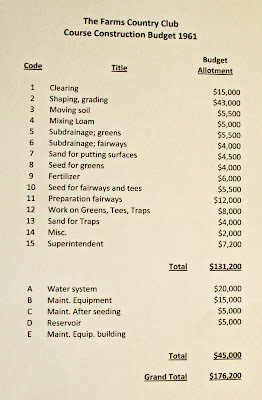 We spend an exorbitant amount of money on labor and materials each year trying to keep the practice green healthy. It has been a losing battle. 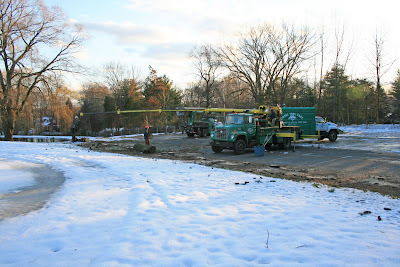 With the proper foundation, sunlight and drainage, we will succeed in providing a quality facility and save money in the operating budget for many years to come. 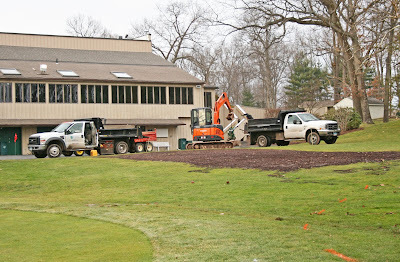 The trees between the practice green and #9 will be replaced with an attractive array of smaller plant material. 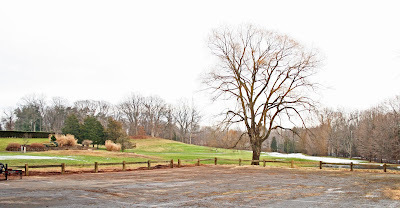 The pines bordering the parking lot will be replaced with a wooden barrier that is the same as what was installed next to #7 green. I will continue to update the blog with photos as we progress. 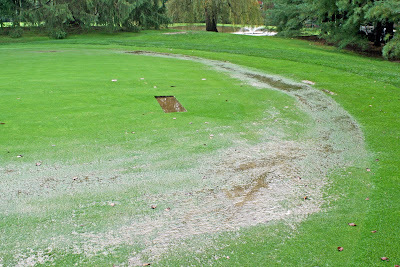 Water Collects and Suffocates Turf. Before View Looking Back Towards Hole #9. 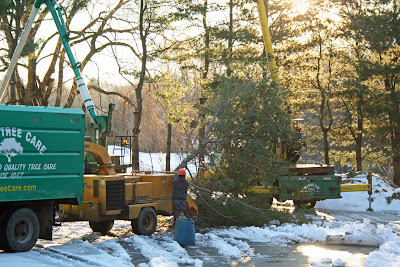 Crane Removes Trunk From White Pine During Removal Process. Removal Completed. View Looking Back Towards Hole #9. 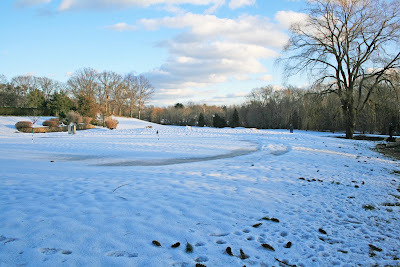 Blanket of snow covers area on 12-09-09. 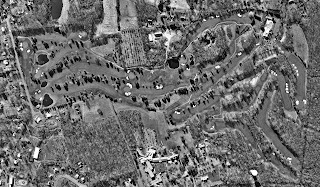 What Did It Cost To Build The Farms CC In 1961? 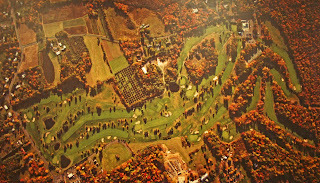 The Farms CC was built for under $200,000 in 1961. Times sure have changed! It looks as though Mother Nature has decided it’s time to put the course to bed after all. 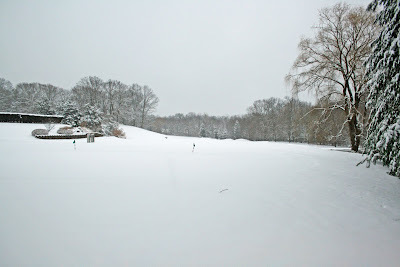 I had hoped we’d get another week of golf on the greens. Unfortunately, the forecast is calling for high temperatures in the 30’s and lows consistently below freezing. We have no choice but to close the greens this week. 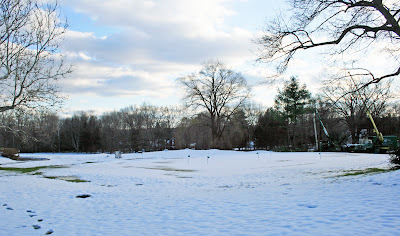 We will, however, have temporary greens available as soon as the snow melts. 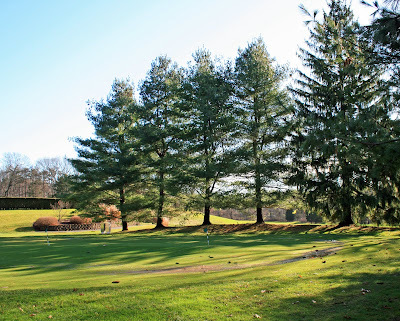 Has anyone ever wondered what the founders of The Farms Country Club may have envisioned? This is what Clubhouse Architect Derek Kipp originally proposed for the clubhouse and surrounds. This is what Golf Course Architect Geoffrey S. Cornish's original conceptual design was. Quite different than what we see today, 49 years later. What does the maintenance crew do on a rainy day? 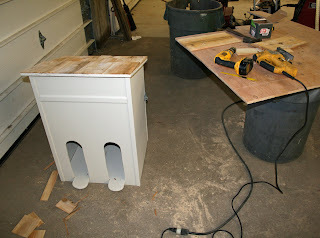 Yesterday we started building our own water cooler houses. Periodic replacement is necessary after years of exposure to the elements. We are building three this winter. A Linden tree snapped at its base and fell during the storm on Saturday, November twenty-eigth. The high winds associated with the storm (gusts up to 50 MPH) were more than the tree could handle. 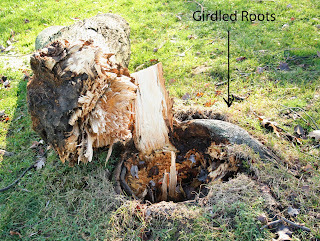 The roots of the tree were girdling the base which weakened it. Girdling is basically a form of strangulation. We have seen several Linden trees with similar problems over the years. 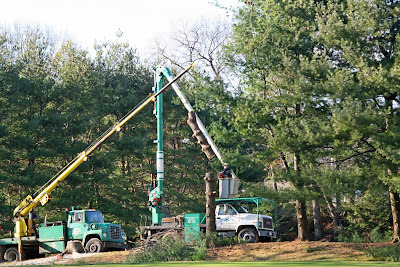 Recently we had to remove a Linden tree on hole #7 for the same problem (photo below). 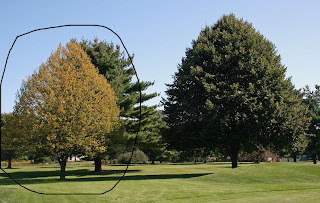 Note the difference between the dying, girdled tree that is circled and the tree next to it. They were planted at the same time 26 years ago. I know because I planted them at the young age of eighteen. 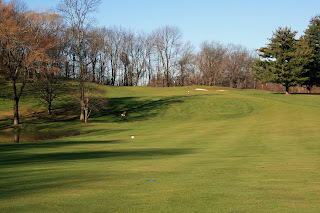 The 1st photo is of the front 9. It was taken by an unknown source in 2007. The 3rd photo was taken in 1993. Bunker reconstruction and the re-build of #5 green took place in 1996 & 1997. Note the shape of the property. Any guesses? Think logo. That's right! The course is shaped like a horse! Ed performing the dastardly task! We have all come to know and love the dreaded task of dealing with greens aerification. Maintenance employees prepare for days of dawn to dark hours and golfers prepare for poor putting conditions. The only one that loves the process is the turf which can now breath again after the long periods of stress. You’ve all heard me discuss that greens aerification is the most beneficial cultural practice I can do to provide you with the best putting conditions possible during the long uninterrupted playing season. What you may not know is that we are always looking for ways to improve upon the process. 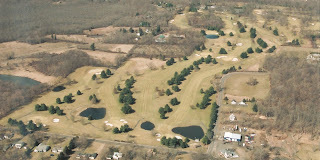 We constantly strive to attain the healthiest turf while reducing member inconvenience. 2010 will be much improved! We will be using a different more versatile style aerator which provides more flexibility in hole size and quality. The early season aerification will be done by making holes that are only the diameter of a golf pencil. Immediately following the aerification, the greens will play much better and the healing process will be quicker. The September aerifying will be performed with tines that leave a hole size that is slightly larger than what was used in the spring aerification. Again, smaller than any hole in 2009. In addition, we will now be separating the more invasive deep tine aerification to late November. This will greatly improve the late September healing that has been less than pleasant this fall. We will be testing different deep tine hole sizes to find the least invasive. 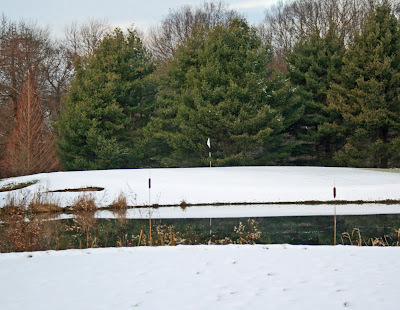 The goal is to find a hole size that still accomplishes the agronomic goal yet doesn’t cause the undesirable putting conditions in the spring of 2011. As you can see, the plan I have formulated should truly improve your experience with the most imperative turf conditioning tool at my disposal. I hope you’re as excited as I am as we look forward to a tremendous 2010!